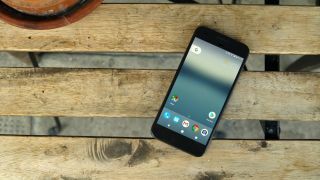 It's increasingly looking like the Google Pixel 2 won't feature a 3.5mm headphone jack, but a new report suggests the company may be preparing for any negative backlash in a similar way to how Apple handled the iPhone 7. The report suggests that Google might be preparing its own alternative to the Apple AirPods bluetooth headphones that will launch alongside the Pixel 2 and Pixel 2 XL. We've previously heard word of Google launching its own headphones with the phone, but the latest report suggests these will be Bluetooth rather than connecting to the USB-C port. The headphones - codenamed 'Bisto' - have been spotted in code before, but the latest look at the Google for Android app by Android Police has identified a battery indicator for the new headphones. That suggests it will be a Bluetooth headset after all, but it's not certain if they will be truly wireless like the Apple AirPods. Apple's Bluetooth headphones pair easily with the iPhone 7 and come with a seperate charging case, but it's currently uncertain if this is how the Pixel 2 headset will work. What also isn't clear is whether Google will decide to include the tech in the box rather than selling it on the side. AirPods cost $159/£159/AU$229 on top of the price of the iPhone, so Google may decide it doesn't need to put them in the box with the new phone.